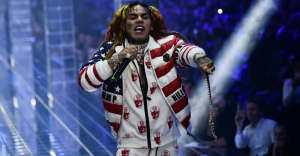 On the way home from shooting a music video in New York City, 6ix9ine was pulling into his driveway when three men blocked his driveway and forced the rapper into their car. According to TMZ, the men then demand that 6ix9ine tell them where his jewelry and cash were inside his home. Two men then went inside the home and took around $750,000 worth of jewelry and $15,000 in cash. 6ix9ine's child and the child's mother were inside the house at the time but were not harmed. They then put 6ix9ine back into the vehicle and began driving around again. Sometime during the kidnapping, 6ix9ine was pistol-whipped. He finally managed to escape the vehicle and ran to a stranger's car asking for the driver to call 911. The rapper remains in the hospital at this time.